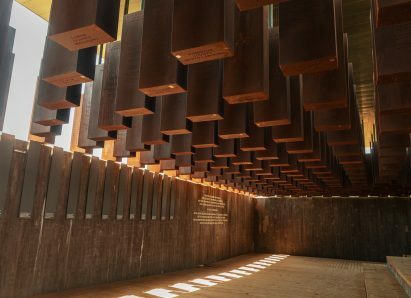 A memorial to the victims of lynchings in the United States has opened with mixed reactions. Find out more in this week’s CLP Current Event. Brought to teachers by Susie Marcus, CLP consultant, with CLP staff. Extended conversation with Bryan Stevenson, the founder and executive director of the Equal Justice Initiative, the nonprofit behind the National Memorial for Peace and Justice, the country’s first-ever memorial to the victims of lynching in the United States. Why should lynching be memorialized in a museum? Is knowing history a way to right injustice? Does this museum evoke negative reactions? Do Confederate museums tell a different story? How is lynching a symbol of “extra-legal” actions? What happens when people take the law into their own hands? What constitutional rights are violated in a lynching? Why did Congress fail to pass an anti-lynching law in 1930’s? Why might it be important to talk about past wrongs? 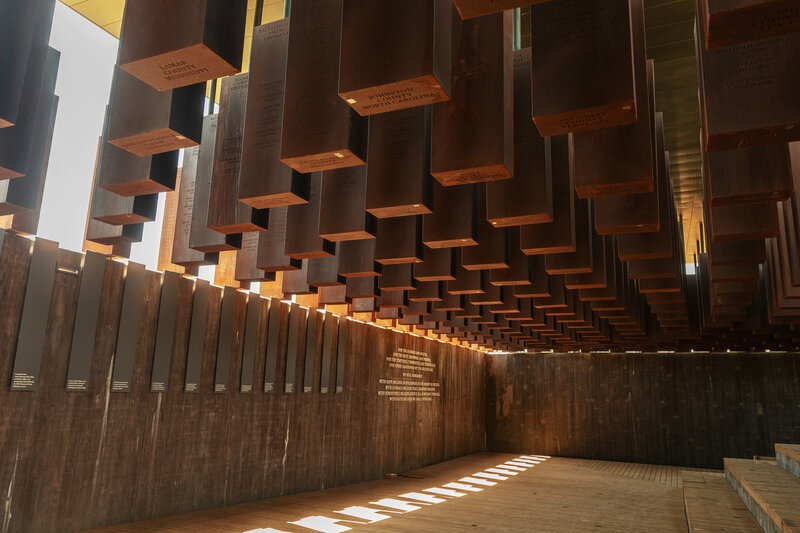 How might the lynching memorial open up conversations about past and present injustices? Why is the memorial located in the South? In what ways is this museum similar to the Holocaust Museum? What is the Equal Justice Institute? Who is Bryan Stevenson? What is mass incarceration? Do the challenges to the current criminal justice system connect with lynching? Is casual use of the word lynch disrespecting the violations of lynchings? How does the Legacy Museum, a companion piece to the memorial, end with a nod toward the future and a “jarring expression of confidence in the possibility of change,” according to the article, and why? CLP: Middle & high school; video, graphic, and good questions! “February is Black History Month, not that there’s much evidence of it here on the Oregon coast. 8.8 Evaluate information from a variety of sources and perspectives. 8.14 Explain rights and responsibilities of citizens. 8.21 Analyze important political and ethical values such as freedom, democracy, equality, and justice embodied in documents such as the Declaration of Independence, the United States Constitution, and the Bill of Rights. 8.26 Examine a controversial event, issue, or problem from more than one perspective. 8.27 Examine the various characteristics, causes, and effects of an event, issue, or problem. 8.28 Investigate a response or solution to an issue or problem and support or oppose, using research. HS.1 Evaluate continuity and change over the course of world and United States history. HS.9 Identify historical and current events, issues, and problems when national interests and global interest have been in conflict, and analyze the values and arguments on both sides of the conflict. HS.24 Analyze and critique the impact of constitutional amendments. HS.35 Examine the pluralistic realities of society (e.g., race, poverty, gender, and age), recognizing issues of equity, and evaluating need for change. HS.57 Define, research, and explain an event, issue, problem or phenomenon and its significance to society. HS.58 Gather, analyze, use and document information from various sources, distinguishing facts, opinions, inferences, biases, stereotypes, and persuasive appeals. HS.59 Demonstrate the skills and dispositions needed to be a critical consumer of information. HS.60. Analyze an event, issue, problem, or phenomenon from varied or opposing perspectives or points of view. HS.61 Analyze an event, issue, problem, or phenomenon, identifying characteristics, influences, causes, and both short- and long-term effects. HS.63. Engage in informed and respectful deliberation and discussion of issues, events, and ideas. Unit 5, Lesson 26: How does the Constitution safeguard the right to equal protection of the law? Unit 6, Lesson 29: What are the rights and responsibilities of citizenship? Unit 5, Lesson 31: How do the Fourth and Fifth Amendments protect against unreasonable law enforcement practices? Unit 6, Lesson 35: How have civil rights movements resulted in fundamental political and social change in the United States? Unit 6, Lesson 37: What key challenges does the United States face in the future?